In addition, the Kent History postgraduates group met this week to hear presentations given by Dean Irwin and Janet Clayton. 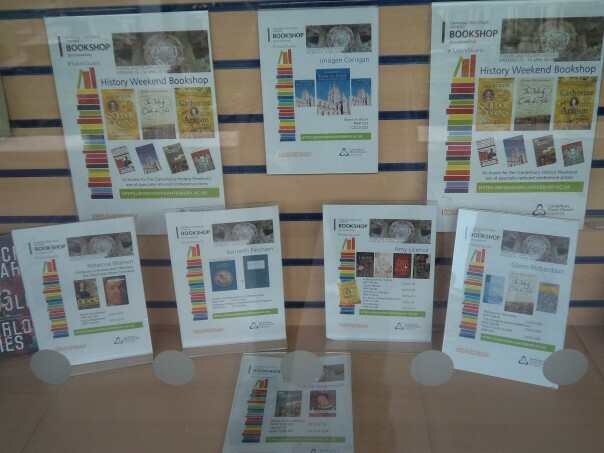 The group also welcomed two new doctoral students Jane Richardson and Maureen McLeod, who will be studying different aspects of the history of Tonbridge. In Jane’s case she will be focusing on the activities of Cardinal Wolsey regarding his dissolution of certain religious houses to found university colleges as a mean to provide an educated clergy, amongst other matters. While Maureen will be examining the development of the town, especially regarding matters of landholding and lordship. This will bring in aspects of landscape studies. 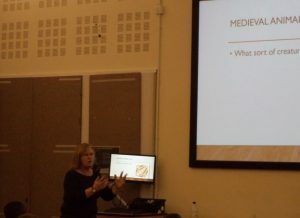 However, to return to the two speakers on Wednesday, Dean’s audience was treated to an examination of the recording practices followed in the later 12th and 13th centuries concerning Jewish moneylending. In a not dissimilar way to the organisation of Feet of Fines, acknowledgements of a debt arising from what we would see as a loan were recorded in a tri-partite form, such that copies could be held by the two parties, the third part provided on the Crown’s behalf. This third part was to be kept in a chest at one of number of urban centres across the country. One of these centres was Canterbury, and Dean discussed the distinctive characteristics of the Canterbury recording practices, and the seeming particularities of certain scribes. This generated considerable discussion, including the relationship between orality and memory, and the written record. As Dr Justin Croft has shown, the increasing sophistication of scribal practices very much date from the later end of Dean’s period, including an understanding of the rhetoric of the fallibility of memory and thus a privileging of the written record, albeit such records were said to draw on ancient precedence and authority. 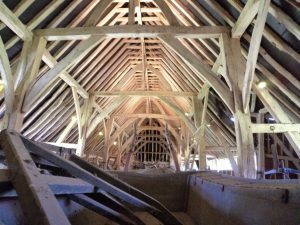 Janet stayed within the 13th century, but she wanted to explore the use and value placed on woodland in the Hundred of Ruxley. She prefaced her presentation by saying that, even though she has found some evidence, most of it is little scraps of information rather than something like a series of woodwards’ accounts, which might have allowed her to find out how the major landholders managed their woodland. For economically the woods were a source of great timber (for houses, ships, carts etc); for coppicing and pollarding (the latter protected your trees from deer eating the young leaves near ground level); for underwood, used in the making of charcoal and firewood, to which might be added brushwood and the use of thorn bushes. Although not from Ruxley Hundred, thorn bushes were used in association with Dover’s medieval town wall as ‘filler’ for the wyke on the wall’s seaward side, what today we might call sustainable technology. From Janet’s standpoint, the principal matter she wishes to investigate is how far Londoners were involved in exploiting these forests, and among the questions she is posing is, if London did take a great deal of the timber and wood for fuel, was it transported by river or road? As you might expect this may relate to the proximity of the main road (modern A21), but timber was also certainly shipped from the estuarine port of Erith. Other aspects that interest Janet are the deployment of the woodland for leisure pursuits. Hunting was a favoured pastime of the aristocracy and this area of north-west Kent was in easy reach of London’s mercantile families and their aristocratic neighbours. Janet’s deliberations similarly provoked considerable discussion, not least certain similarities to land use to the south of Ruxley around Tonbridge. Thus Dean, Janet and their audience should be thanked for an extremely interesting session. I now want to report on the Medieval Education Day that was organised by The Canterbury Tales visitor attraction and involved four organisations scattered across Canterbury. For as well as The Canterbury Tales itself, groups could attend events run at The Beaney, the Westgate Towers, and at Canterbury Christ Church. 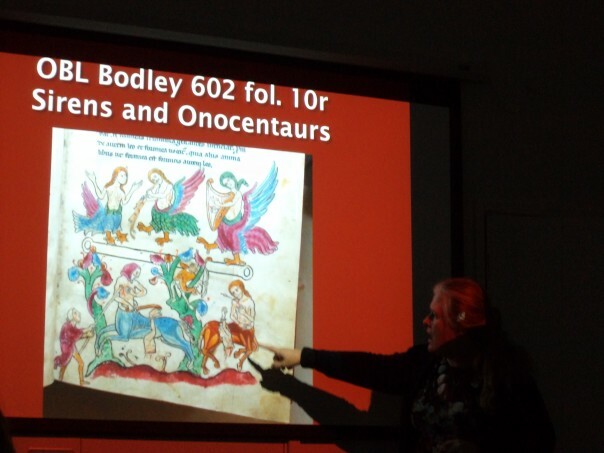 The CCCU event was organised by the Centre, the event headed by Dr Diane Heath because it featured medieval animals. Lily Hawker-Yates and I assisted Diane, the idea being to make the primary schoolchildren honorary guild members of the tilemakers’ guild for the day. 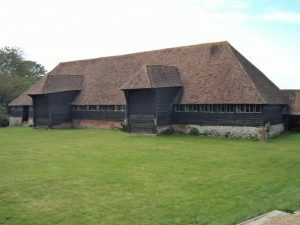 In total we were visited in Old Sessions by four school groups between 10.00 and 14.15, the schools involved being Bridge and Patrixbourne, and The Canterbury school, which meant that in total we welcomed over a hundred pupils, and their teachers and helpers. As Diane explained to the children, 800 years ago Henry III was a boy king when he took part in a great celebration in Canterbury concerning Thomas Becket (the translation of the saint to his new shrine). To celebrate this event, Diane said the archbishop had commission a new tiled pavement for the cathedral that was to feature tiles showing medieval animals. This is where our young audience came in because they were to make lots of different ‘animal tiles’ for the archbishop and the young Henry. Diane then got them thinking how we recognise a particular animal – a fish has scales, fins and a ‘fishy’ tail, while dogs have tails, ‘doggy’ ears, four legs. She then showed them tiles of several animals and they could see how to recognise different animals, including mythical medieval beasts such as gryphons/gryffins (thanks to Harry Potter) and the phoenix. Then it was the children’s turn and they initially drew their ‘medieval animals’ on scrap paper before redrawing them on the polystyrene ‘tile’ provided. 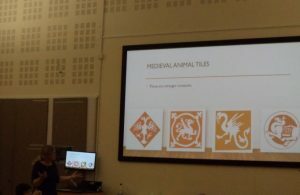 Most of the children were very creative about their designs, but to help anyone unsure we had provided lots of pictures of medieval animal tiles to inspire them. 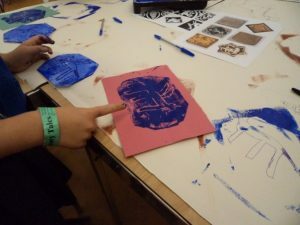 For anyone who has done lino printing, you will know all about this technique, and once they were happy with their design we got them to go over it again so that when they came to printing ‘their animal’ it would show up well. Some of the helpers also etched an animal on a tile and then we were ready to distribute the paint. As those who have worked with children will know, this is where things can get quite colourful! 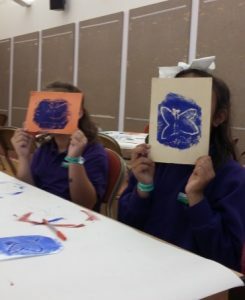 However generally speaking all the groups were very good and almost all the paint went on the tiles and scrap paper covering the tables, not on the children or anywhere else. Each child rolled out some paint onto their etched tile and then placed it on their sheet of paper (having written their name on the paper first). Then having pressed it firmly they removed the tiles to delighted exclamations as they saw their animal staring up at them from the paper. So each child had a sheet with their printed animal and their etched tile, and they then each carefully put these in a clear bag provided. Due to the tight schedule it was time to go, and they left their bags on the table because, as Diane explained, they would each get a certificate to show that they had been an honorary guild tilemaker for the day and we needed to fill in the certificates with their names. We arranged with the teachers about collection either tomorrow or early next week, and the children left Old Sessions for their next event. We also gave the teachers a handy summary of the activity so that they can repeat it if they wish, and it was clear from many of the comments, as well as the designs themselves, that lots of the children had grasped the idea that medieval people drew on what they saw around them and their imagination when they were thinking about animals for something like a tiled pavement. Moreover, they seemed to enjoy doing something creative with an interesting end result, and, even though we shall probably never know, it is certainly possible that a day like today will have sparked an interest in history, and especially medieval history. Consequently, the day was good educationally as a way of engaging with young people and the community – excellent for them, the Centre and CCCU more broadly. Next week it will be the Nightingale Lecture, including the distribution of Ian Coulson Awards, and who knows, one of these children might receive such an Award in the future if we and those who come after can keep the Ian Coulson Memorial Award fund alive. For a day like today would have been just the sort of day Ian would have revelled in – where tertiary education meets primary education to the benefit of both. Thus, I should like to offer many thanks to Diane and to Lily her very able assistant.